We live in a world dominated by video game nostalgia. HD remakes are being released in droves and games like Shovel Knight are showing us the games of our past as we remember them. Armillo is a game that doesn’t immediately appear to be part of that movement. It might not even have been designed as such, but it feels decidedly old school in spite of its modern presentation. Armillo for the Wii U feels like the sequel to Marble Madness (an amazing Nintendo era video game) that I have always wanted. Players are tasked with controlling a space armadillo and controlling him as he rolls around sphere shaped levels destroying obstacles, gathering keys and avoiding hazards (lots and lots of hazards) . There is a story that involves fighting off a race of robot invaders, but that largely serves as window dressing for the arcade-style action within the game. This wasn’t the most complex gaming experience I had ever had, but I could not take the smile off my face while I was playing. 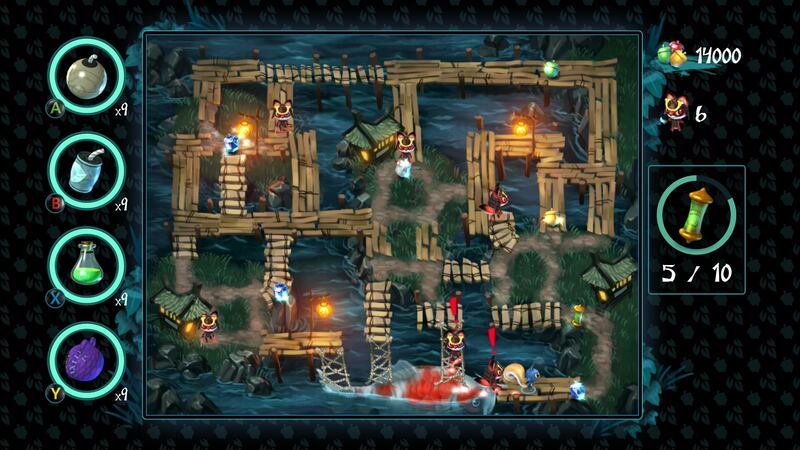 Every level presents new challenges and new environments to play in. Some of the hazards were more frustrating than they were “fun” (I’m looking at you block mazes! ), but nothing ever felt unfair. This is important because Armillo is definitely not an “easy” game to play. I gave my oldest son a shot at playing the game and it took some time for him to adjust to the controls, but he was able to make a reasonable amount of progress before his motor skills started to fail him. All in all, this was an enjoyable experience that was definitely worth my time and I think that your family will enjoy it too! There is nothing to be concerned about here. Armillo is an alien armadillo that rolls around spherical mazes. There is no foul language, blood, etc. I would feel comfortable letting anyone play it. There are two control methods available for Armillo that drastically change the ease of playing the game: joystick and motion. 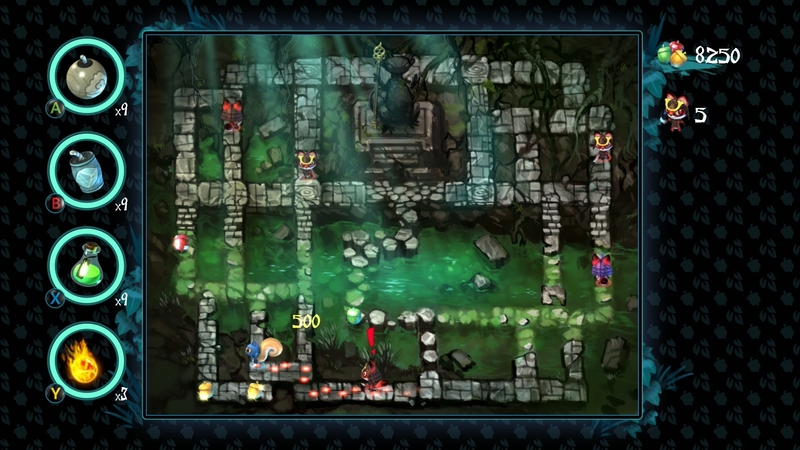 Using the joystick manually controls Armillo as he rolls through the different mazes. The motion controls make use of the sensors within the Wii U game pad to allow players to control him that way. This choice is available in the options menu and is entirely up to the player. Everyone will find their personal preference. Armillo is a simple game, but it is a unique experience that players will not find anywhere else. Its low price point ($7.99) makes it a great impulse buy or reward for good behavior. Many of us have been playing games for more than twenty years. There are a lot of games in the rear view mirror for us. So many, in fact, that we just don’t remember how they actually played. We love them so much that we forget how absolutely soul crushing they could be. 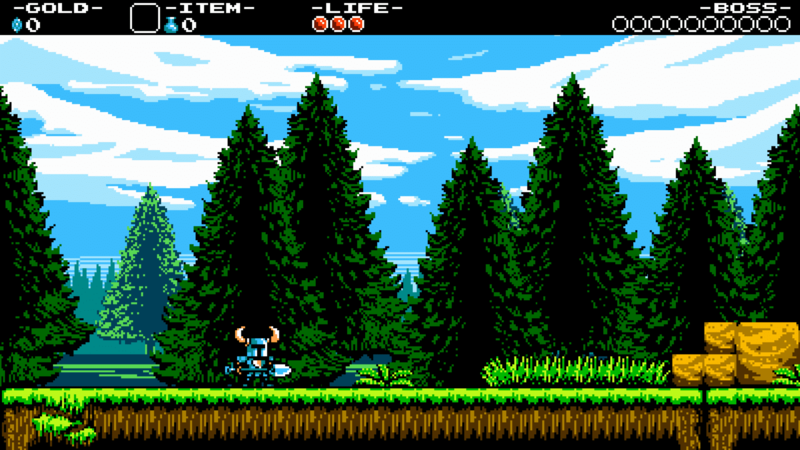 Shovel Knight is a rare game that evokes all of those positive memories without constantly slapping its players in the face with archaic game mechanics. Shovel Knight was a massively successful project on Kickstarter and it feels like the entire gaming population has been waiting with baited breath for its release. 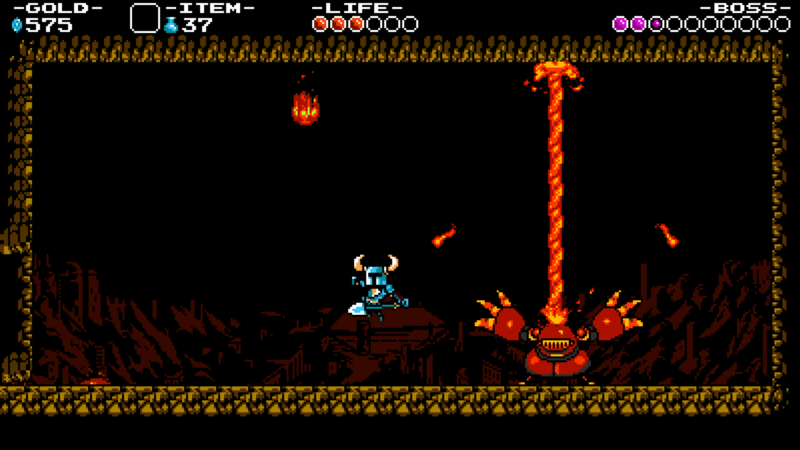 That time has come and I am pleased to report that Shovel Knight delivers on all of its promises. 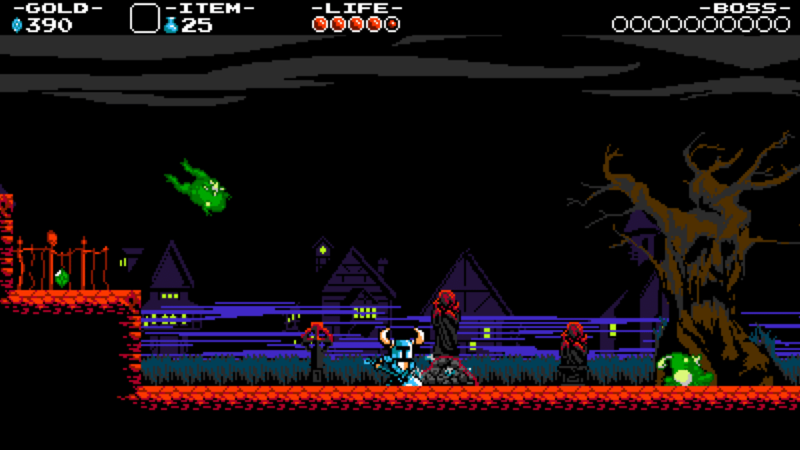 The most noteworthy feature of Shovel Knight is its 8-bit retro aesthetic. 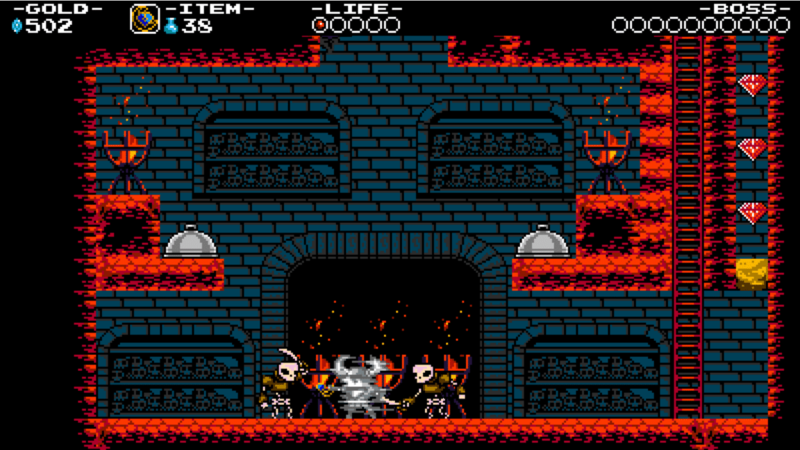 It draws inspiration from the pixel art used in classic NES era games like Mega Man, Castlevania, and Ducktales. 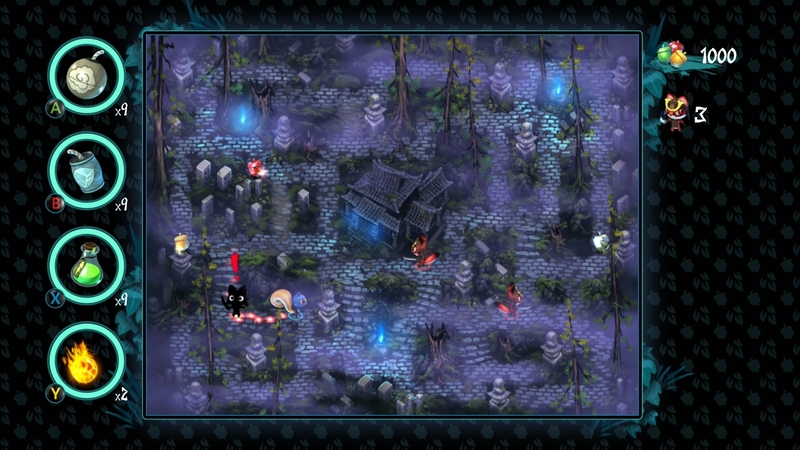 The environments are stunning and the monsters are crafted to remind us of the games of our youth. The premise of the game is straight forward. 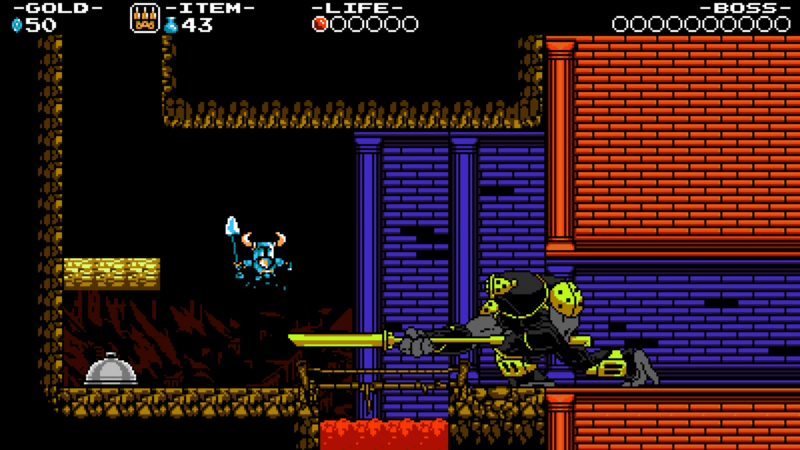 Players control the great hero Shovel Knight on a quest to defeat the members of The Order of No Quarter and reach the evil Enchantress and rescues his beloved Shield Knight. The Order of No Quarter is a nefarious team of evildoers made up of the likes of Plague Knight, Treasure Knight, Mole Knight, and Propeller Knight (among others). Anyone who noticed the familiar naming convention gets bonus points for paying attention! The different stages and their boss encounters match up very well with those that we will remember from the Mega Man series. 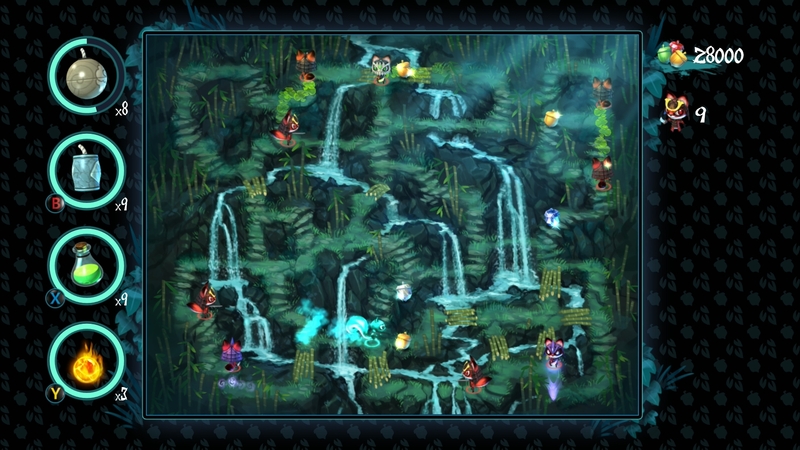 Each boss has a specific theme and their stages are masterfully built to match. 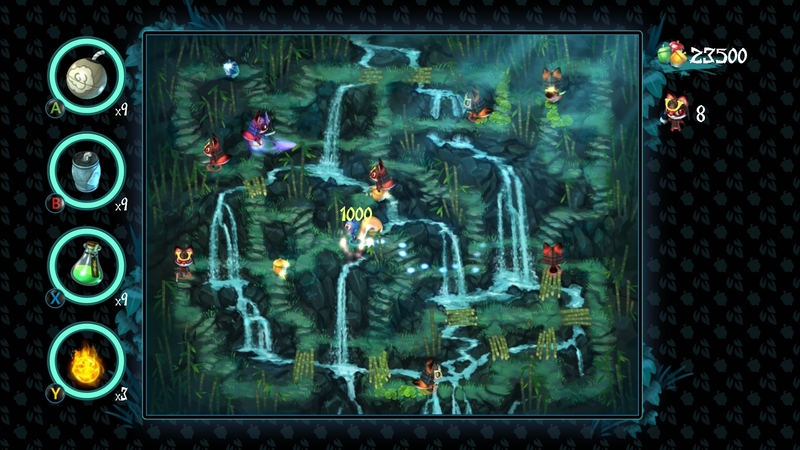 The different boss stages are well balanced and full of challenges. Each of them forces you to learn a new set of tricks and continuously build on it until the end. The good news here is that checkpoints are spread generously through each of the levels; many of them placed immediately after significant challenges. This is one of the most welcome design decisions Yacht Club Games has made. Spacing the checkpoints out even a little bit more might have taken the game straight from “difficult” to “frustrating.” Instead, we are treated with a smooth cadence of challenges that keep us motivated to push forward as opposed to recoiling from them. The entire game is masterfully built in a way that invites players to achieve as opposed to punishing them for failure. That, in and of itself, is perfection made real in modern game design. 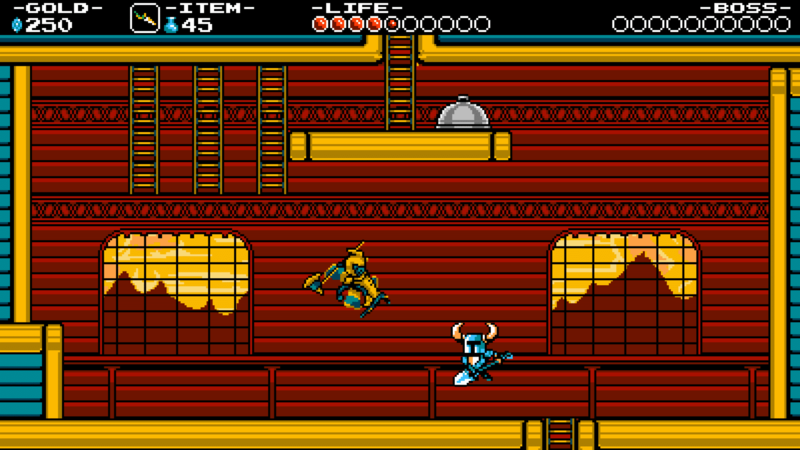 Shovel Knight does involve combat, but it is abstracted by an 8-bit animated aesthetic. Outside of a few creepy moments in Specter Knight’s level there is nothing that should concern parents from a content perspective here. 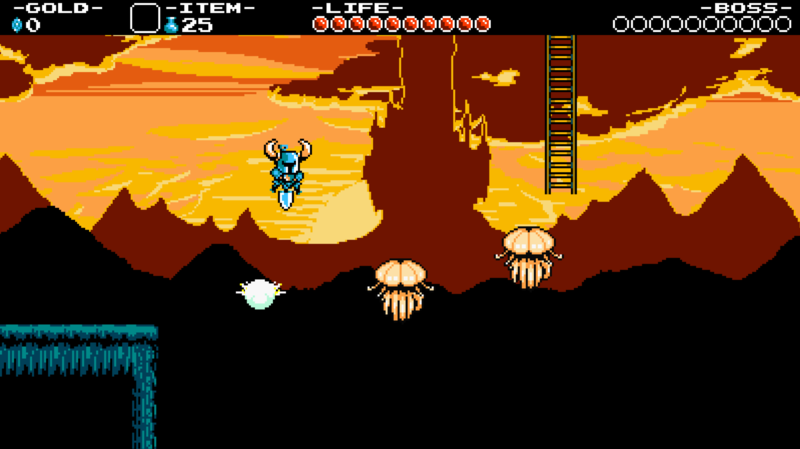 Further, Shovel Knight is a true hero. He attempts to make peace with as many of the foes that stand in his way as possible. In fact, his hesitation to do battle in favor of talking this out is a pleasant change of pace as so many “heroes” rush in swords drawn or guns blazing. There is no sugarcoating this folks. 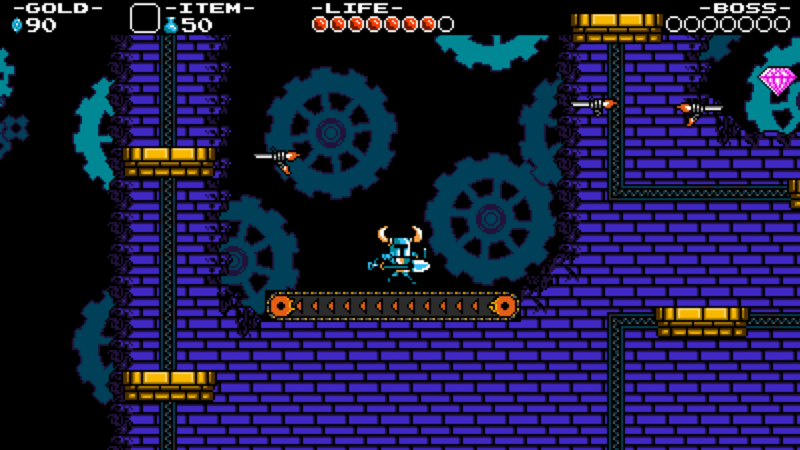 Shovel Knight is very difficult. It is rated E for everyone by the ESRB, but this is a game that can be discouraging to inexperience players. 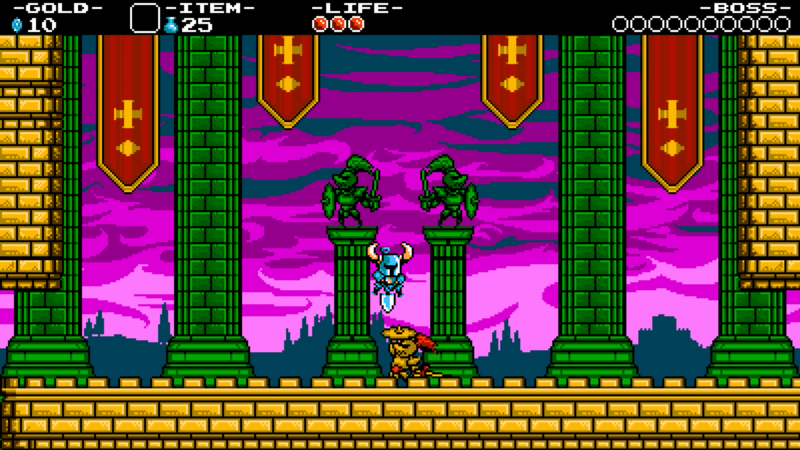 Yacht Club Games was gracious enough to provide me with a copy of the game for my eight year old son’s 3DS so I could have him give Shovel Knight a whirl. He found the character and the story interesting from the outset, but he grew frustrated within a few minutes of starting the game. His biggest challenge came from dealing with the downward shovel/pogo bouncing that is required to advance through certain challenges. Put simply, this is not a game for novices. With that said, the game is inviting and is possessed of a light sense of humor that youngsters will enjoy. I noticed him picking the game back up when I wasn’t watching to try and master some of the challenges. 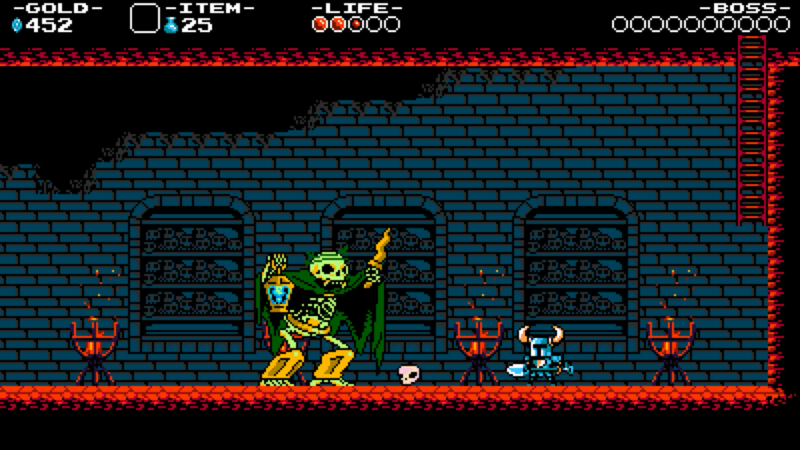 He may not be playing it for long stretches, but if he earns his platforming chops from Shovel Knight I am terrified for my ability to compete when he is older. Much of the game’s story is delivered through text so children who have a difficult time reading may miss some of the finer points of the story, but a parent sitting beside them and reading the dialogue (with exaggerated voices of course) is as good as many story books we will read to them. 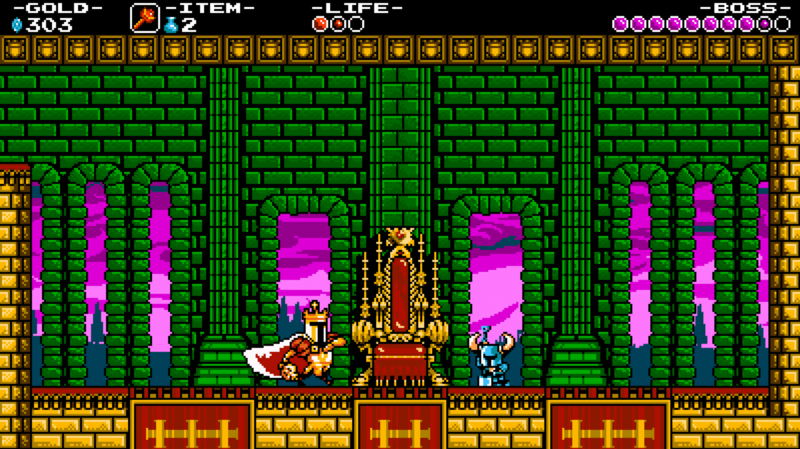 Shovel Knight is now on the short list for my game of the year. It is just that good. I recommend this for anyone who enjoys challenging platformers. Parents of young children will want to keep this game on their radar for the future and buy it up once you feel they are ready for a real challenge. Yes. 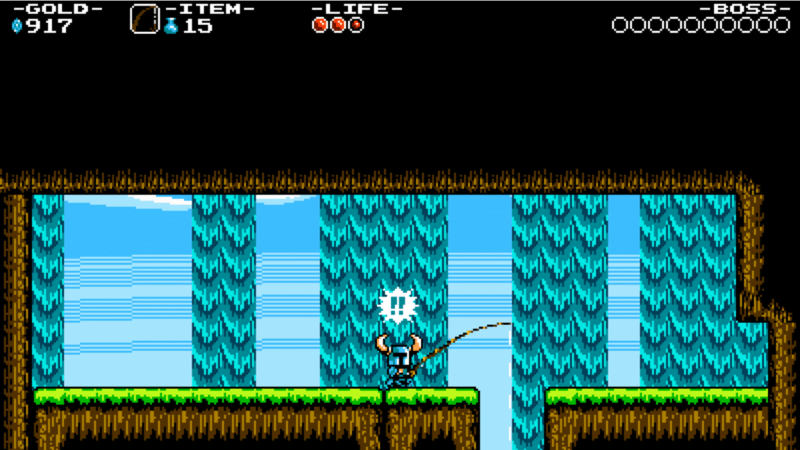 You can go fishing in Shovel Knight, too! 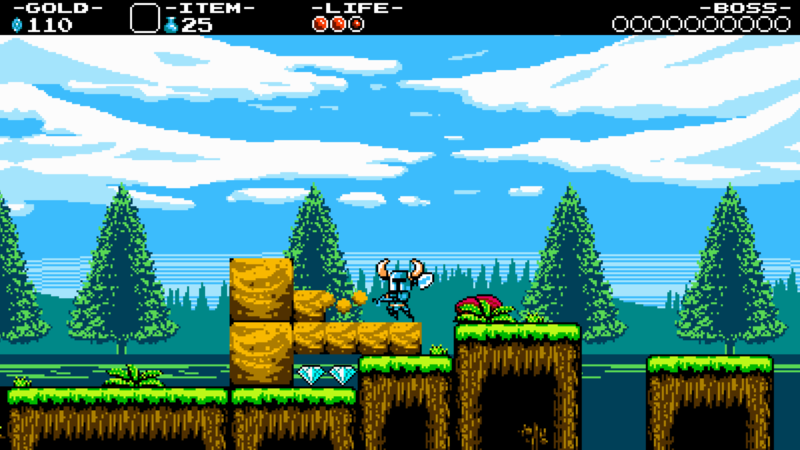 The action in Shovel Knight is instense! Some of the monsters are MASSIVE! Some enemies are a challenge to defeat! You'll have to dig for your treasure! Those are some pretty trees! Gears and conveyor belts huh? Where's Metal Man? The Phasing Bracelet is an amazing tool! Those pages aren't going to last for long! Get ready to jump! Shovel Pogo off of floating jellyfish? Sure! Why not? This is one of the tougher monsters in the game! (and it looks it)! The Legend of Zelda: A Link to the Past was released on the SNES and is regarded by many as one of the best games in the franchise. The Legend of Zelda: A Link Between Worlds (LBW) is a 3DS sequel that is so similar to the original that it almost feels like putting on a good pair of running shoes. Link even swings his sword with the same sweeping arc. This game just “feels” good. LBW isn’t just a great source of nostalgia though, it is just short of a work of art. The animation is beautiful despite its simplicity and the score is top notch. I have a tendency to play a lot of 3DS games with the sound turned all the way down. That is simply not an option here. The orchestral soundtrack is one to be enjoyed and stands up to some of the best soundtracks I have ever heard. Trust me parents when I say that you will NOT grow tired of this music as you might think you will. It is just that good. The Legend of Zelda: A Link Between Worlds is a sword and sorcery themed adventure along the lines of the Lord of The Rings. 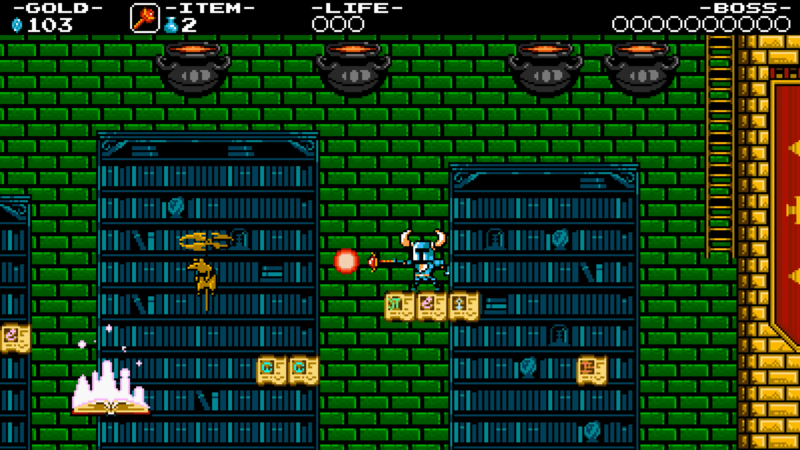 As such, players take on the role of Link, a young hero, and use a sword, bow and arrow, bombs, and other weapons to defeat fantasy creatures that range from skeletons to sentient slimes. The conflict in this game is resolves almost purely through combat. But, despite all of that, there is very little to be concerned about. Link’s enemies are very rarely human and they all vanish in puffs of smoke when defeated. 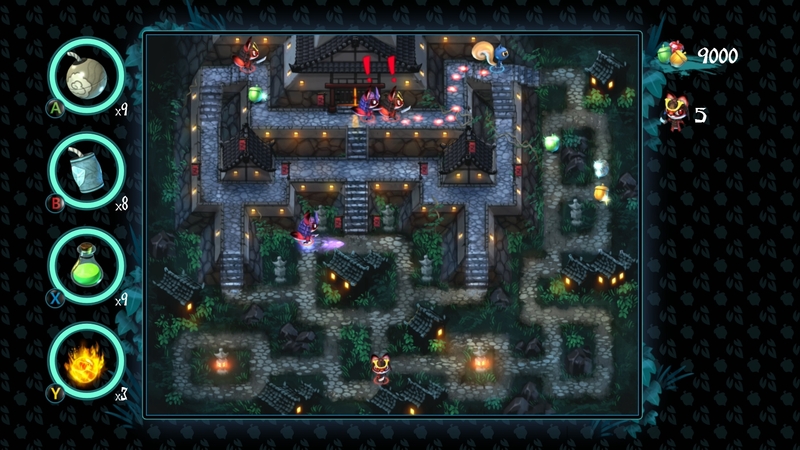 The art style of the game sports a playful and childish aesthetic that helps drive home how harmless the combat is in this title. This is a very challenging game. 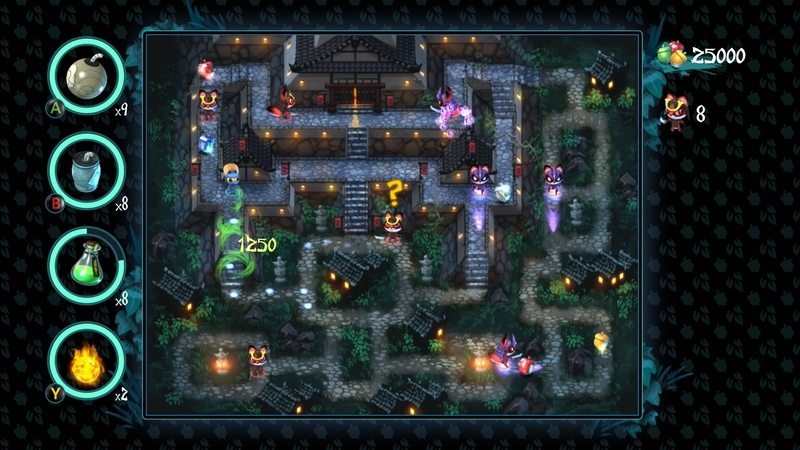 Players are asked to explore a large open map to locate dungeons that are essentially puzzle-filled mazes. 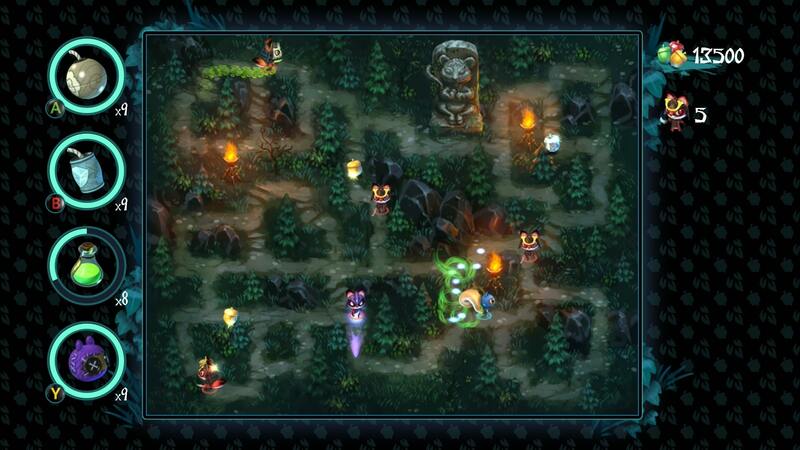 Link is provided with multiple weapons that double as tools to help solve the various puzzles he encounters. The true challenge comes from balancing all of these tools to solve puzzles while monsters are hunting you down! 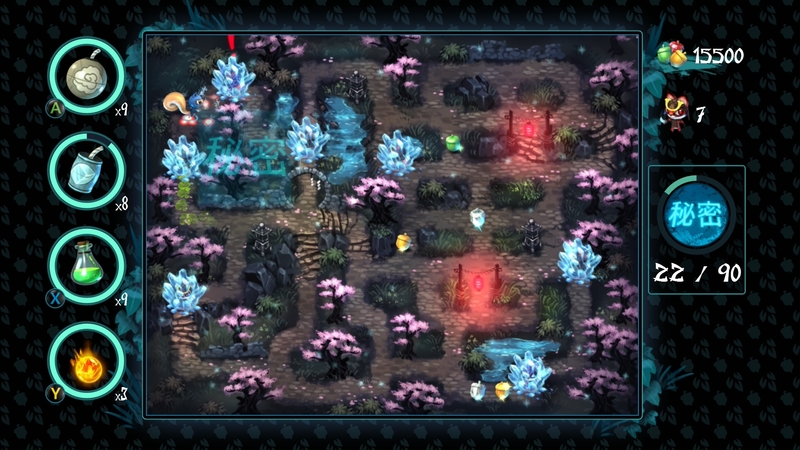 There are multiple sources of information available to help solve the various puzzles within the game so they shouldn’t be a deal breaker on their own. But, if your child is easily frustrated or dislikes puzzles and puzzle game play, then this is a hard game to recommend. This is a must own for just about any 3DS owner. Editor’s note: We know that this isn’t a particularly new game. We have a back log of reviews that were written, but not published during our hiatus over the holidays. So we’re publishing them now! Super Mario 3D World is pure multiplayer perfection. Mario games have included 4player game play for years, but they have always been more about spreading chaos and dissension than about fun. Those days are over. Super Mario 3D World gives up to four players the chance to step into Mario, Luigi, Peach, and Toad’s shoes without stepping on each other’s feet. The switch to a 3d plane helps here. 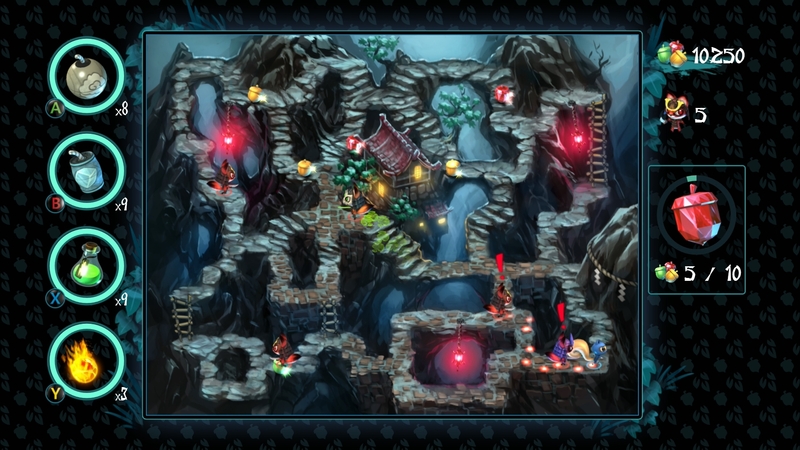 Levels are designed to be large enough for everyone to do their own thing without impeding each other; this is all but impossible in side scrolling levels in more traditional 2d Mario games. This style is excellent for allowing players of varied skill levels to participate in their own way. I have spent a lot of time playing with both of my boys (8 and 5) and we have been enjoying ourselves immensely! It also needs to be noted that 3D World is likely the most gorgeous Mario game I have ever played. Simply put, anyone who has said that Mario wouldn’t benefit from sharper and more colorful visuals is definitely proven wrong here. The WiiU has struggled to find a foothold in the world market and has thus far failed to move the kind of units that its predecessor, the Wii, did. Super Mario 3D World may not be ‘the solution’ to that problem, but the only thing that Nintendo can do is to improve the quality of its WiiU library as quickly as they can. Super Mario 3D World certainly helps with that goal and is a must own for anyone with a WiiU. Mario titles are the poster children for family friendly video games, there is nothing to be concerned about with this game. 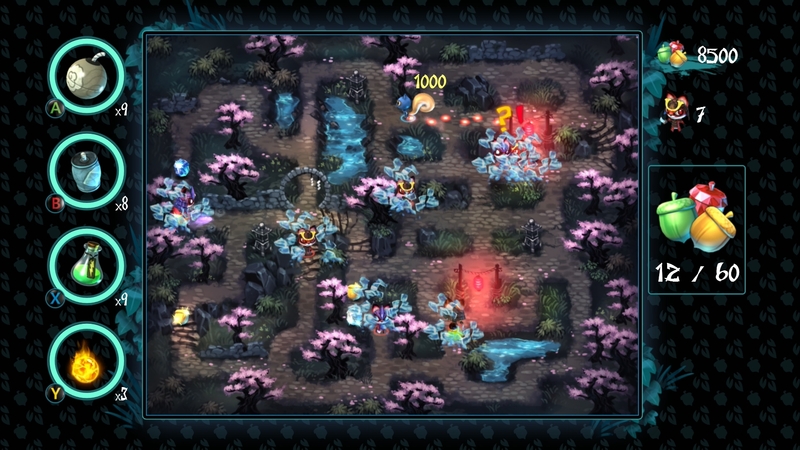 It is worth noting that this game does prominently feature a playable female character, Princess Peach, who has a very unique and often advantageous power. She has the ability to hover over obstacles. Peach may wear a pink frilly dress, but this is a great chance for young girls to feel good about selecting a female character that they can enjoy playing that isn’t just tacked on. In fact, my entire family has been known to fight over playing her, that isn’t terribly common among a group of boys. This game is a 3D platforming game. This can make it very challenging for young children who struggle with navigating their characters on a 3D plane. Mario games are, historically, very challenging. 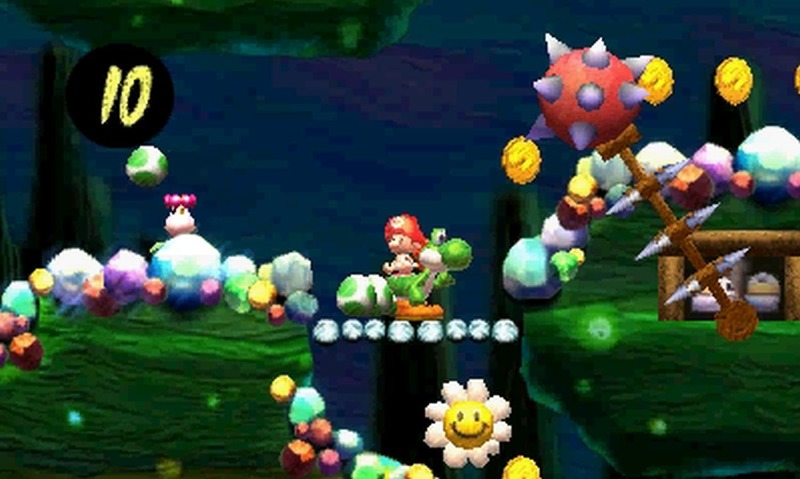 Recent games in the franchise have softened the challenge slightly by providing a power up at the beginning of a stage after a player has failed five times. 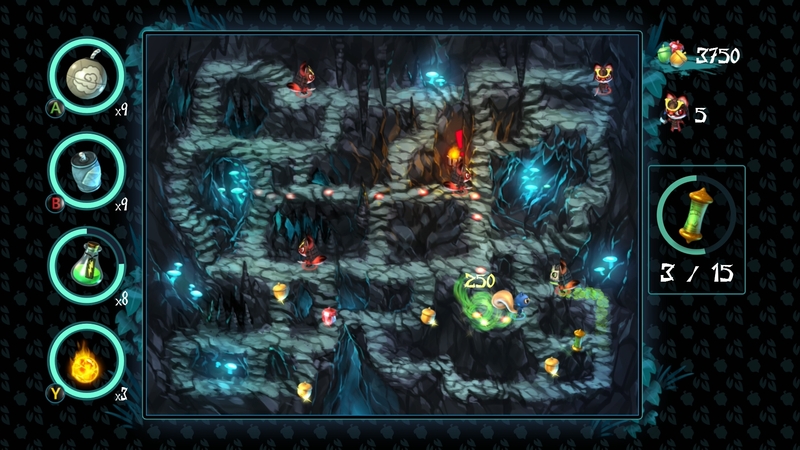 This power up makes the player permanently invincible throughout the level, but doesn’t protect them from falling into pits. In a way, this provides a sort of middle ground to the game where a player can focus purely on the platforming elements before they worry about balancing that with enemies. If you own a WiiU, then there is no reason not to purchase this game. It is just that good. Nutjitsu, an exciting arcade style game, is set for release on May 8th 2014 for the Xbox One. It will be sold digitally for $6.49. Engaged Family Gaming had a chance to play Nutjitsu at PAX East and had a BLAST. I am pleased to report that it was a ton of fun to play. 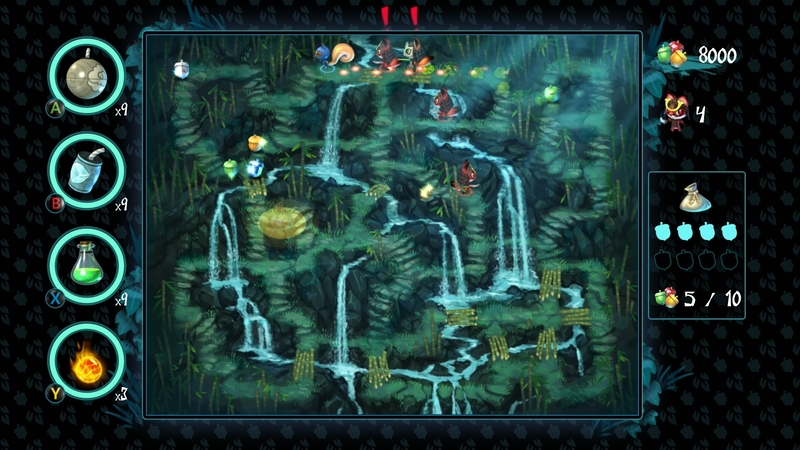 Players control a ninja squirrel as he runs around a maze collecting acorn-shaped jewels and trying desperately to avoid a group of samurai foxes. 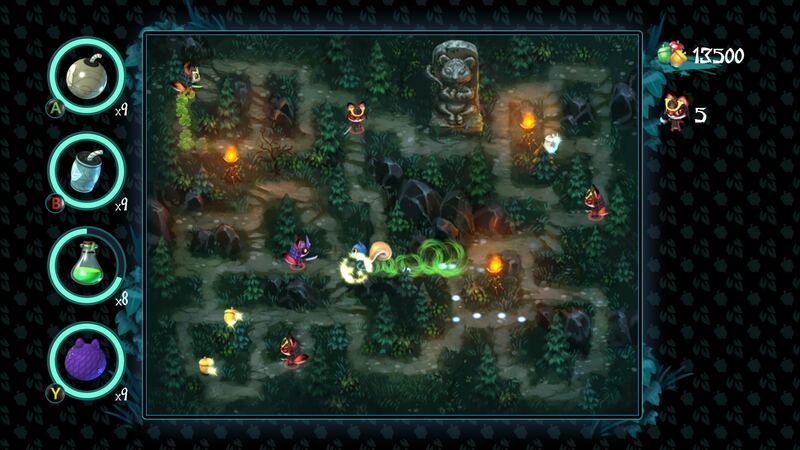 The action is fast paced and reminded me of my days playing Super Bomberman on my SNES. Nutjitsu will sell for a mere $6.49 and will be the first game released on the Xbox One at a price lower than $9.99. This is a great value considering the amount of fun you can have. Here’s hoping this means there is a strong future for budget minded games on the way! Take a look at the screenshot gallery and feast your eyes on the fun to be had! I was jumping out of my seat when I first saw that RBI baseball was being released to help provide an alternative to MLB 2014 : The Show . I knew there was a place in the market for a less complex baseball game that focused on entertainment value and pure “fun” as opposed to being a simulation. In short, I wanted Ken Griffey Jr Baseball for the SNES with a modern aesthetic. As it turns out, I got excited too fast. I am sad to report that RBI Baseball 2014 misses the mark in a few very big ways. I will freely admit that a lot of my disappointment is built on expectations. The (relatively) low budget and the cartoonish art style led me to believe that this would be a casual baseball game. But, instead I found that big data like the MLB PITCHf/x influencing the outcomes. This should seem like a small gripe, but the end result was a stale experience that lacked the grandeur of the full simulation we find in The Show OR the casual appeal of the classic baseball games of previous generations. The one bright side to this title is that it is family appropriate. There is nothing to be concerned with here. RBI Baseball 2014 is not difficult to control. I would hesitate in encouraging younger children who have no experience with baseball to play. But, players should be able to “make the game work” just fine. It pains me to say it (considering my initial excitement), but this game isn’t worth it unless you are desperate for a baseball fix and simply can’t buy MLB: The Show 2014. Baseball season has come around again, and with it has come MLB 14: The Show. Conventional wisdom is that annualized games suffer for it. It is believed that the short development time leads to poor development decisions and truncated QA testing. MLB 14: The Show is a series that defies that pattern. It has been one of the most consistently rated sports titles over the past decade and the 2014 entry is no exception. MLB 14: The Show is a baseball simulator that tries to replicate the experience of controlling a game that you are watching on a television and they more than succeed. The visuals are nothing short of astonishing. The character animations are incredibly detailed and accurate to the individual players. The characters eyes are a little dead, but that is to be expected. Animators haven’t been able to get past that barrier yet. As impressive as the graphics may be the true strength of The Show is in the baseball itself. Players are forced into the shoes of whatever position they are controlling and face all of the challenges and decisions that the professionals do. Pitching is an exercise in strategy and batter manipulation as opposed to seeing how “fast your fastest fastball can go.” Likewise, batting is FAR from a hackfest. Players will need to swing carefully and avoid being baited into chasing pitches into the dirt (just like the pros). This does increase the challenge and complexity of the game so young children who don’t understand the subtleties of professional baseball might struggle. Another area where The Show excels is in respecting your time. There are a number of options available to help limit the overall length of a game. They give you the ability to limit the TV presentation bits like always, but this year they have added a new “Quick Counts” feature. This actually simulates the first handful of pitches based on historical stats. This shortens games significantly (and might be the only reason some people actually finish a whole season in franchise mode). MLB 14: The Show, and other games like it, are designed to accurately recreate the experience of watching a game live on television. If you are comfortable letting your child watch a baseball game then there are no reasons for concern. This is a sports simulator. It is designed to represent, as accurately as possible, the skills and strategies that players use in the professional game. This adds a significant learning curve to the experience. The developers do take care to provide a simpler experience for those who would like it. They include the ability to turn on one button hitting and pitching and automatic fielding as well. These are simple changes that help make the game more accessible to casual fans of the sport. If you are a baseball household then MLB 14: The Show is a good purchase, but be aware of the difficulty curve. NBA 2K14 is as much a celebration of basketball culture as simulation of the NBA itself. 2K sports has done an excellent job of recreating one of the most popular sports in the US. It really is fitting that the cover athlete is Lebron James. This game has an air of greatness that you can only really doubt if you aren’t paying attention. Players are treated to a wide variety of game modes, each of them highlighting a different facet of the NBA experience. This includes modes like “Lebron James: Path to Greatness” that puts players into his shoes in pivotal moments of his career. If your family is chomping at the bit for the NBA season to start, then this should provide a taste to get you through. This could be the most perfect basketball game ever made. If you are comfortable with your child watching an NBA or NCAA basketball game on television, then this game should be no problem. 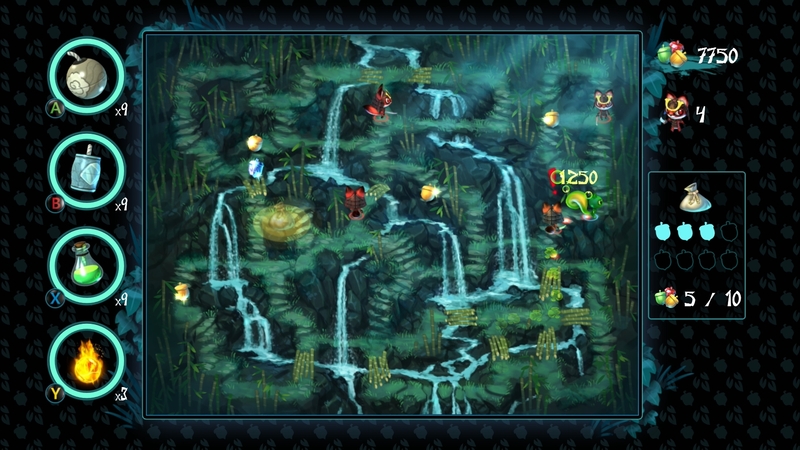 Several of the games modes do, however, require online play. Most online games carry the same warnings. The game developers have little to no control over game experiences that involve other players. The online gaming environment can be toxic so be aware of this is if you plan to let your child play this, or any, game online. This game is remarkably difficult. The most notable difficulty spike is caused by a complete lack of a tutorial mode. There is a practice option, but the game does not provide instructions, you are just given a half court to use without any distractions. There is information available online, but it does not match the teaching power of tutorial modes like the one found in Madden games. The game’s AI (artificial intelligence) forces players to think like professional basketball players. You can’t just run wildly down the court and lob up shots. You need to pay attention to where your teammates are, pass to the open man when possible, and take open shots. If you ignore those basic principles then it really doesn’t matter what you do. Kids who are intent on playing their own way and aren’t adept at changing their strategies to meet the demands of the game they are playing will have a lot of trouble with the game and could grow frustrated. This is a must own for families that are fans of the NBA. It boils down the essence of the NBA experience and gives everyone a chance to shine like Lebron. This can be an empowering experience for young players and help them get excited to learn the game themselves. Who knows… maybe they will grow up to be part of the next generation of NBA All-Stars?